The Henri Temianka Audio Preservation Lab, named for the renowned violinist and leader of the Paganini Quartet and the California Chamber Symphony, is a purpose-built audio preservation facility with two studios created to preserve the unique audio materials held by the UCSB Library and migrate them to digital formats. Additionally, the Henri Temianka Audio Preservation Fund supports the Library's mission to make our recorded sound heritage accessible to the widest possible audience as conveniently as possible. 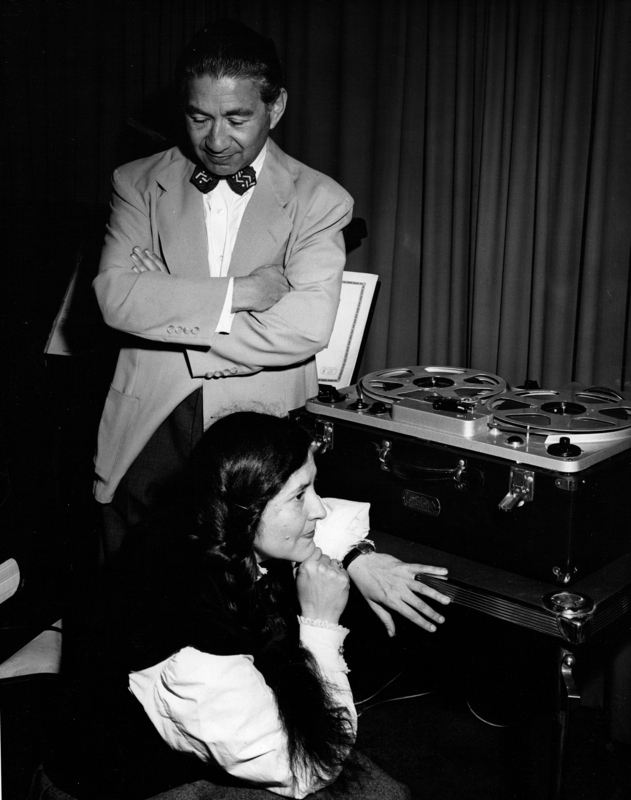 Henri Temianka and Lili Krauss audition a recording of their Beethoven sonata performance, early 1950s. The Library undertakes systematic preservation of endangered and obsolete formats for preservation and access as well as making on-demand copies for researchers at a reasonable cost. The lab is an integral component of the library's world-class audio preservation program, and the fund allows the library to migrate hundreds of hours of unique recordings every year to digital formats that are stored on library servers for preservation and access. The lab has two studios equipped to play back most formats in the Library’s collections, including cylinders, discs, and open reel audio tape, as well as modern digital formats such as DAT and Mini-Disc. Almost every audio format of the 20th century is supported, including obscure formats like wire recordings and Dictabelts. Equipment in the studio has been chosen to provide the highest quality playback while remaining faithful to the original sound source. Some of the features that allow high-quality transfers are the use of professional equipment (often sourced on the used market and restored by experts around the country), purpose-built equipment for formats like cylinders, the highest quality analog-to-digital converters, balanced audio signals, and balanced AC power throughout. The Henri Temianka Audio Preservation Fund was made possible by a generous donation from Daniel Temianka M.D. and Zeinab Dabbah M.D., J.D. Henri Temianka taught at UCSB from 1960 to 1964 and his contribution to the world of music through concerts, sound recordings, and teaching lives on with the help of their philanthropy.